I had really high hopes that I’d get to quilt one of my own quilts last month. I’m not sure why, since the entire month was chock full of deadlines, and I’m still running behind on the customer backlog. What was I thinking? No time to quilt anything of my own, as usual. But one of these days! There are only two lonely numbers left to choose this year from my list of 12, and for me this month, it’s #3. I made this quilt from a tutorial by Amber at A Little Bit Biased. I finished the top a long time ago, and it’s been languishing in the “to be quilted” pile ever since. 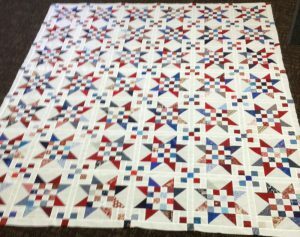 I LOVE this quilt, and I do want to get it finished soon; I’ll have to see if I can squeeze in a quilt of my own this month! If not, look out December! I’m scrambling to get caught up on the customer stuff during November, so that I’ll indeed have some time to do a few things for myself before the end of the year — not just quilting things, but house things as well (the remodel has come to a screeching halt because I have no time to paint) — December will be a month of me catching up on “me stuff”, I hope — and slowing down a little for the holidays, too. My friends keep telling me: Stress kills! If I can manage to fit this one in this month, it’ll be one less I’ll feel obligated to get done in December, though, right? And I have yet to finish any of the 12 projects on my Procrastination list this year, although I have moved some of them further along. I need to do better next year, that’s for sure (or make a different list — haha)! I’m actually anxious to see what I can yet get done this year, and already thinking ahead to next year’s list! What project will YOU be working on this month that you’ve had on the back burner for way too long? We still have 59 days left in this year — lots of time to accomplish great things! I really like that pattern. I am having cataract surgery this coming Thursday morning. I won’t be doing much for a week or so, until I get used to seeing right again. Then I am in hopes to get my turkey table cloth ready for Thanksgiving day. It’s quite large so not sure for this year. But it will be finished for next year. My goal for next year (I hope) is to finish all my UFO’s. I have about 7 or so. I really want them done. And having a really good machine will help. By the way I really like my new Juki a lot. I did not even start on last months project – The Saggy Baggy Elephant quilt. But I am happy to say I completed the Quiet Book. I have three items left on my list both are prior months projects not completed. 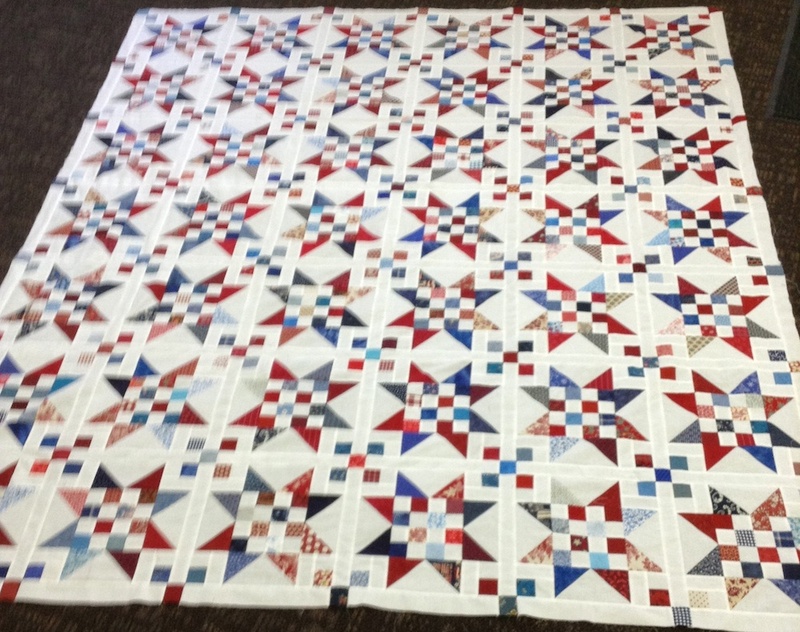 This month is the quilt of valor quilt I have been working on for my brother. I have hoped to have completed and shipped in time for Veterans Day but at least he will receive in November. I quilted it this weekend and all that is remaining is the binding. I love your Scrap Jar Stars quilt. Thanks for the push to help clean up some lingering projects. I had a great big delay in finishing or starting anything last week. I had bronchitis and did absolutely nothing from Thursday until late last night. Did watch the World Series games. Yay, KC Royals. This morning I am cutting out a quilt for my grandson that has to be done before Thanksgiving Week. Let me loose…………here I go. I am kind of floundering. The only thing that is catching my attention has not had a single strip cut nor can I find my pattern. I have made it before so I can just get the measurements from my quilt so that isn’t a big issue. I even bought a black that I liked over the weekend which really made me happy. I have had this fabric kitted up for at least 4 years. I guess I should just succumb! I’ve got a long list – but I’m off from work 9 days so hope to make productive use of the time. Specifically I’m working on a QAYG project from the fall of 2006 and piecing Sew Scrappy from April 2013. I also want to prep the black & bright swap block top for quilting (May 2007), catch up on the pillowcases and quilt the 3rd disappearing 9-patch (May 2015). It seems that I finished my #3 sometime earlier this year, so I’m going to work to catch up on the 4 I’ve not done that should have already been done this year. I had such high hopes of finishing several quilt tops, but I’m just not sure where the time goes? How can it already be November?? Where did the year disappear to? Ooh, I do hope you can get this one quilted, what a beauty! I try not to even think about all the quilt tops I have still waiting to become quilts. I’m woefully behind in my Procrastination Challenge but I won’t give up hope. There’s always next year….I won’t pretend that I can finish one from my list in December.